Planning your wedding in Goa ? Blue skies, beautiful weather, gorgeous beaches and palm-lined landscapes – Do you dream of having your wedding in gorgeous Goa? 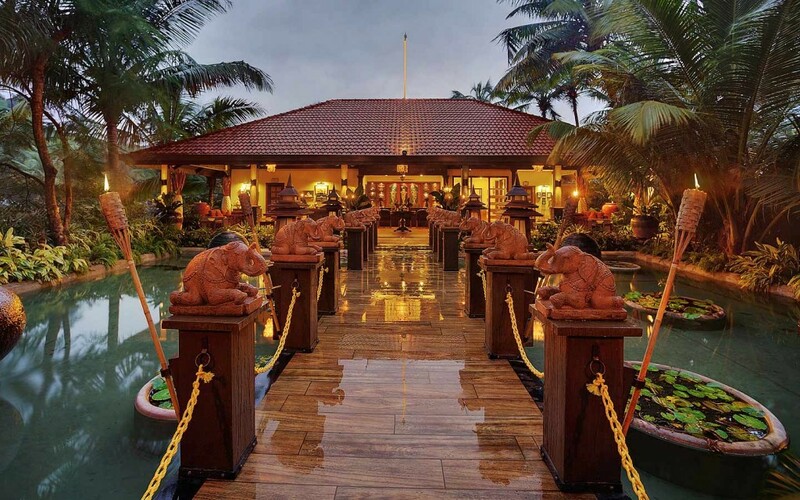 Stone Water Eco Resort, Taj Aguada, Grand Mercure Shrem, La Cabana, Marriott Goa, Taj Exotica, Royal Orchid Beach Resort, Aguada Anchorage and Kenilworth Beach Resort are excellent choices. All these hotels have more than 50 rooms and have beautiful venues to host weddings. Planet Hollywood, Cidade de Goa, Radisson Blu, Alila Diwa and Leela are among the best options. All these properties have more than 100 rooms and are ideal for mid-sized grand destination weddings in Goa. Holiday Inn, Zuri White Sands, Ramada Caravela Beach Resort, Lalit Golf and Spa Resort, Park Hyatt and Grand Hyatt are spectacular options. All of these properties have more than 200 rooms and are widely spread out with many lawns and beach facing venues. Note:- All these hotels negotiate a group discount for hotel rooms. Wedding planners and travel agents will help you get a better rate for rooms than you would be able to get yourself as they give these hotels business throughout the year in lieu of preferred rates. Also, many a times we choose the resort on behalf of our clients who are out of the country and our clients visit Goa for the first time for their wedding. However, this is not recommended. We would advise you to visit the hotels, comparison shop, etc. before finalizing on your venue. Try to visit Goa once (or twice if necessary) before your wedding. Goa like any tropical place, has some good months and some months you should definitely avoid. The best months to get married in goa are from end of October to the beginning of March. During these months, the evenings and nights are pleasant and humidity is under control. June to September are monsoon months in Goa and beach weddings are not permitted by the Government during this time. April, May, October are low seasons as they are hot and humid. However a beach wedding in these months is possible in the evening (sunset wedding). Goa is known for its pristine white sand beaches, great weather and for being able to host your ceremony in unique open spaces and sea facing lawns. However, you must remember that Goa is a popular wedding destination and people book venues much in advance. You should allow some time for researching and booking your preferred venue. Also, we would recommend booking your venue at least 6 months in advance. It would be great if you can book your venue 8months-12 months in advance to avoid losing out on your favorite hotel! Also you should be thinking about giving enough time to your guests to plan their trip. So the earlier you book your venue, and send out your save the date cards, the earlier your guests can book their tickets at a more affordable price. In my opinion, it is almost impossible to plan a destination wedding in Goa without local planning support. Hiring a wedding planner you feel comfortable with and trust is important. People tend to think that wedding planners are really expensive and are only for the big weddings. This is a myth. A good planner will help lower vendor prices as they give vendors orders through the year and are aware of the correct market rates. A good planner will also present you with better and more innovative ideas and help you steer clear from a cookie-cutter and run-of-the-mill ordinary wedding. The planner will help keep your budget in check and will also keep check on your planning process and schedule. Find a planner who will be responsible for negotiating the best venue deals, best vendor prices, taking care of guest management, arranging the décor and all other such arrangements. This can make things a lot easier for you. Before deciding on your favorite flowers, colors, and spending endless time pinning your favorite details you have to set your budget. This is probably the best and first thing you should do. Your wedding budget will work as a tracking system for all things wedding related from small vendors, photography and make up. This will help you not only keep track of what you spend but also decide on which items you want to spend more, which less and what things you might end up not needing. Make sure your wedding planner is aware of your wedding budget from the word go, as they will be able to provide you with good value deals and ideas within your budget. Very important real wedding advice: Budget for travel and accommodation for non-local vendors like your photographer or make up artist if they are not from Goa itself.